The year is rapidly coming to a close. Typically this is the time when things are relatively slow in the industry trenches, at least until the first of the year when the frenzied run-up to HIMSS begins. 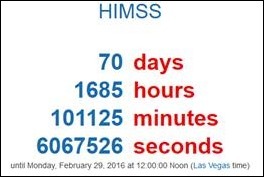 I’ve got my countdown page ready, not because I’m dying to go to HIMSS, but because I’m excited to see many of the friends I’ve made in the IT world that I only get to see once a year. Although we stay in touch through email, it’s just not the same as being able to get together in person, share a drink, and swap stories. Of course I’m also excited about HIStalkapalooza, although I haven’t given a single thought to my shoe wardrobe yet. Several of my colleagues are still waiting to see if they will be able to make it to HIMSS. Those who are vendor employees have seen cuts in the number of attendees sent by their companies the last several years. Others from the provider side sometimes find HIMSS to be not only overwhelming, but given the current economics of medical practice, not worth the cost. There are also those who work at faith-based organizations that will not pay for conferences held in Las Vegas, but at least those folks know outright that they’re not going to attend unless it’s in Orlando since everywhere else seems to be out of the running. I’m wondering what the big buzz will be about this year. Meaningful Use is old hat, although there will still be some picking over the bones of Stage 3. Value-based reimbursement has been on the rise, although for many, it’s more of a buzzword than an actual strategy. The reality of putting together some of the IT infrastructure required to maximize the promise of value-based reimbursement is daunting. Although the large health systems and academic medical centers can be demanding about their networks and try to control their physicians, it’s put a terrible strain on independent practices and also on patients who want to see physicians across multiple systems but are being steered to stay within the vertical. It was bad enough when insurance networks were restricting choice, but to have your physicians negatively incented to refer you to the consultant of your choice is another thing entirely. Many people think that interoperability should solve this problem, but the reality for many physicians is that interoperability is a joke. Not only are there incentives biased against sharing from the hospital side, but as an independent physician, I can’t even get access to the hospital web portals in my area because I’m not on staff. Being a member of the medical staff has not only a financial cost but a professional one, with many hospitals requiring physicians to provide call coverage for patients in the hospital. Although that requirement can often be shifted to a hospitalist physician, they also require physicians to be available for outpatient follow-up, which is nearly impossible when you are a part-time physician at a practice that doesn’t have scheduled appointments and doesn’t provide primary care. I would love to be able to log into a hospital portal and get follow up on the patients I have to transfer to the hospital. We’re seeing more and more of them as cost-shifting drives them to urgent cares when they really should have been in the emergency department in the first place. Although we’re pretty advanced at my facility, the last few shifts I’ve worked have included multiple ambulance transfers for people who were actively having heart attacks. There was one just the other night with a life-threatening stomach bleed, which let me tell you looks pretty much exactly like it does when they show it on TV medical programs. All of the patients I’ve had to transfer have cited cost and access as the primary reasons they chose us instead of another facility. Since my roots are in primary care, I always wonder how they are doing, but I never see a discharge note or any kind of communication from the hospital despite my multiple Direct addresses that should make it easy. Maybe I should head to the mall and ask Santa to bring me some discharge summaries for Christmas. I’m not sure if the elves have signed a BAA, however. I’m winding up the year with a last-minute lab interface project that is keeping me pretty busy. The client is super nice and had an issue with their lab vendor canceling their contract with minimal notice, so they’re in a hurry to get a new one live before their interface is shut down. The work is somewhat tedious, but that will be good to keep me busy. Today is the shortest day of the year and I’m glad it’s here. I’ve missed having light in the evenings and have had to spend more time on the treadmill than I like. I’m looking forward to longer days and being able to get back on the streets without fear of a broken ankle from tripping over something in the dark. We certainly can’t have that in the run-up to HIMSS. Once this project is done, I’m laying low until the New Year. What are your plans to wind up 2015? Email me. Looking forward to seeing you at HIMSS. Hopefully this time it will be more than the 2 seconds we got last year. My prediction is that we’ll see tons of “patent” focused efforts and also the buzzword will be precision medicine. “It’s always darkest before the dawn…” Maybe for healthcare too?